I'm thrilled to be featured on the Hero Arts' blog today - and I had a lot of fun playing with ribbon. I decided to try out stitching on ribbon and here is the result. 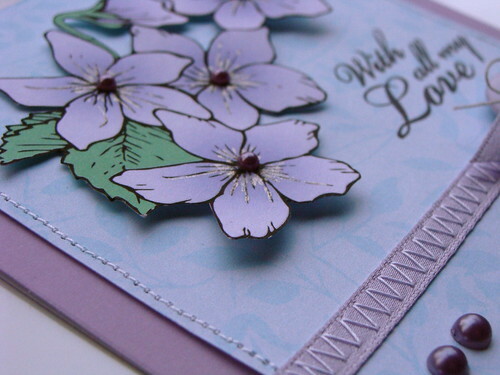 I chose some gorgeous Hero Arts digital kits to play with on this card; the flower is from the 'February Flower of the Month' digikit - LOVE it. The background paper is from THIS kit - I just recoloured it to get the shade I wanted. I used a notecard from the new Floral Folded Cards set and some sweet matching pearls. Love these new Hero Hues. Oh and if you are a bit digi confused, check back on Monday - I will post another mini digi tutorial then. Another outstanding card, Lucy! Love the stitching on the ribbons....Beau-ti-ful! 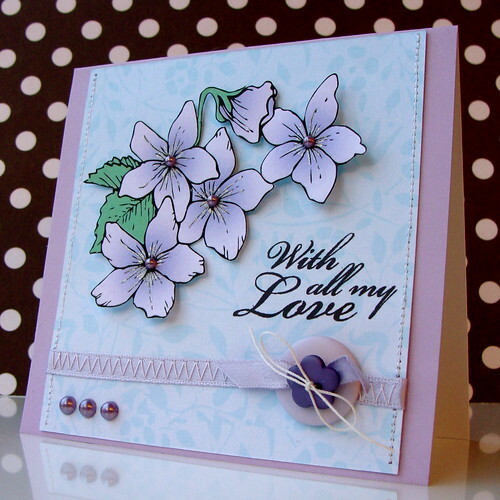 This is very beautiful with the delicate lavender, love this! I love the stitching on ribbon. It's a fantastic card Lucy! That's neat. I had never thought of stitching on ribbon. Thanks! So, so, so, pretty!!! Love the stitching on the ribbon, too. Gorgeous card all around! Such a pretty card Lucy. I am always impressed with your sewing on your cards and this ribbon is wonderful. This card is DIVINE! I can't get enough of it! LOVE your violets, Lucy!! My favorite colors and a sentimental flower for me, too. Beautiful card Lucy! Love the softness of it! This is so pretty, Lucy. I love the layered flowers.